-The Boyfriend App by Katie Sise: this sounds SO CUTE! -How Zoe Made Her Dreams (Mostly) Come True by Sarah Strohmeyer: it sounds like the perfect summer read and I've heard good things about Smart Girls Get What They Want. -Arclight by Josin L. McQuein: sounds CREEPY and exciting! -Undercurrent by Paul E. Blackwell: a male protoganist and memory loss, I'm SO IN! -The Breeders by Katie French: got this for a blog tour, sounds really interesting! -Belle Epoque by Elizabeth Ross: this is on my most wanted debut of 2013 list! Many thanks to Elizabeth Ross for the egalley! -The River of No Return by Bee Ridgway: TIME TRAVEL! YES! -A Touch of Scarlet by Eve Marie Mont: seriously, who wouldn't want to step into a favourite novel?? -Gameboard of the Gods by Richelle Mead: AAH! NEW SERIES BY RICHELLE MEAD! It sounds EPIC! -Just Like Fate by Cat Patrick and Suzanne Young: I still haven't read anything by either of these authors (though I own their books), but I've heard amazing things and this sounds really good! -With This Kiss, part one, two and three by Eloisa James: I love Eloisa James, these novellas sounds wonderful! Thank you so much! I'm really excited to finally own both of them as I've heard many amazing things about these books! -Asunder by Jodi Meadows: AAAH! It's so gorgeous and I can't wait to dive back into this world! -The Archived by Victoria Schwab: I LOVED, LOVED, LOVED The Near Witch, so I'm beyond excitement to read this one! -Everbound by Brodi Ashton: Everneath nearly killed me with that ending, I NEED to know what happens next! -Red Glove by Holly Black: I'm REALLY glad I waited this long to buy these books, cause I would have been heartbroken at the change in covers otherwise... Love this series! -One Good Earl Deserves a Lover by Sarah MacLean: YES! LOVE SARAH MACLEAN'S BOOKS! -Slated by Teri Terry: caught my attention because it's been re-published this year, sounds really good! I haven't bought myself a new book in a while so as a Valentine's Day present to myself I ordered these two books from Amazon! 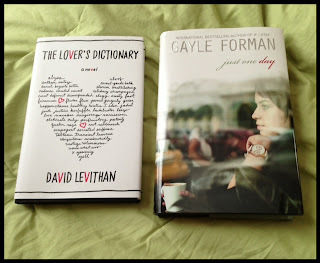 I am SO excited to read both of these books! I've heard nothing but wonderful things about them! Dang that's a huge book haul!!! And so many good books! Awesome! WOW. So many good books! I can't wait to read The Boyfriend App. Mainly because of the cover lol. Unravel Me is really good! And I felt the same way about the ending of Everneath. I got Everbound this week as well and I CANNOT wait to see what happens. Pretty sure it is Sarah Strohmeyer, not Katie. Also, I didn't like Changeling by Philippa Gregory at all, but somehow feel the need to read the next book. I guess I just expect greatness from Ms. Gregory and hope the second book will live up to her reputation. I'm sorry you didn't like the first book, hope the next one lives up to your expectations! SOOO many I want from this list! WOW! Etiquette & Espionage is one I especially want! I got Archived the other week and Unravel Me is one that I got this too! We must have similar tastes Daisy. Happy reading ladies! 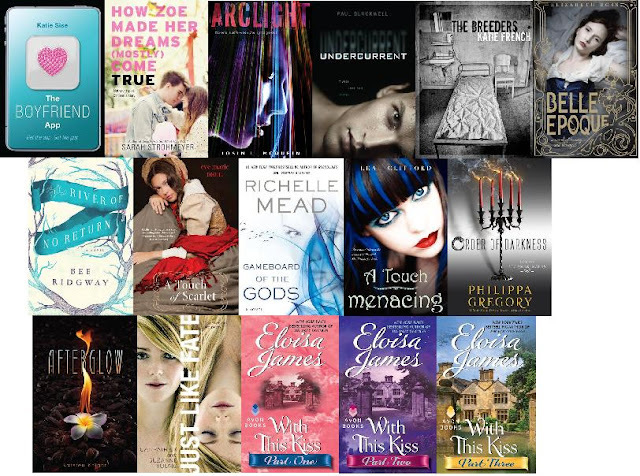 Wow, you all scored some great books this week! I've been eying Etiquette and Espionage for a while, and several bloggers I like have recommended the Sarah MacLean book. Enjoy reading all your new goodies! The Giver is one of my favourite books for ALL TIME! So beautifully written. I can't wait to read Prodigy! WOOH! Oooh and I'm glad you've read White Cat. I loved the older covers :( Now they look weird side by side because they all have a different cover design. LAME! I hate is when publishers do that. 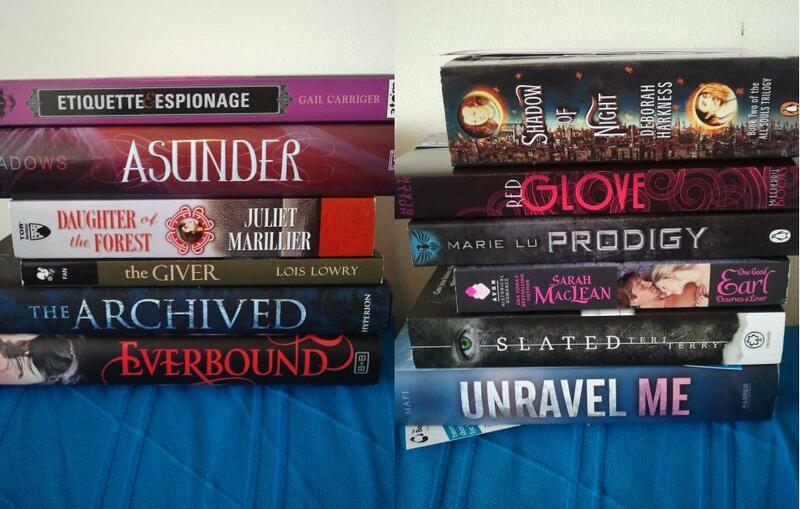 I would kind of love it if The Broke and The Bookish started hosting a weekly Book Haul meme! I won't go back to IMM, and there are little things I just don't really like about Mailbox Monday and Stacking the Shelves. Great book hauls. And cool blog. Oh, I'm about to read Daughter of the Forest too, I recently bought it but haven't had time to start it yet. I've heard so many good things about it!